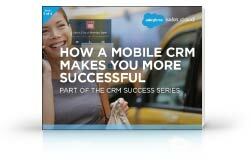 How a Mobile CRM Makes You More Successful. The best CRM solutions go beyond basic functionality and deliver cutting edge features that make the companies that use them more efficient, more effective, and more successful. Chief among these cutting edge features is mobile functionality. Download the free e-book today and see what a mobile CRM can do!